I wrote a post back in June about the need to just start, to not worry about the purists, the elitists – they don’t worry about you so just start. 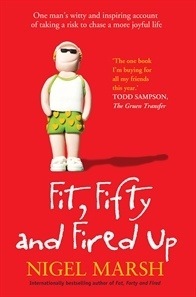 Nigel Marsh reminded me of this recently in his book “Fit, Fifty and Fired Up” – I loved his book “Fat, Forty and Fired” so I thought I would give his new book a go. Nigel used a Anton Chekov quote to describe how he felt about getting on with things “Any fool can face a crisis, it’s the day-to-day living that’s the real challenge” and it made me wonder about how true that is for living a sustainable life. Any fool can change their sustainable behavior by throwing themselves into the self-sufficient lifestyle – riverside cottage style – but the real challenge is change our day-to-day life that is the real challenge. Nigel was talking about this quote in relation to loosing weight but there are so many parallels to losing our planetary over indulgences as well. So, Nigel’s approach “the secret for me is to… slowly and steadily marginally improve my behavior”. Indeed, whether its food excess or consumption excess its far easier to just start, to marginally improve. Don’t try and go from excess to self-sufficiency overnight. “Giving it up all in one go is too much too face”, absolutely Nigel. Set yourself a short term marginal improvement and keep at it. Take Nigel’s 14 week programme. Set yourself a 14 week red meat reduction target – marginally reduce your red meat consumption to get to no red meat in 14 weeks or 50% less red meat in 14 weeks and then review it again in 14 weeks time. If it’s working then try going for a bit more reduction over the next 14 weeks.